An old fengshui master came to my house once because I consulted him (and pay handsomely for that, of course). My children kept getting sick after moving into our house. So, he told us to actually knock down our main door and shif it over to the right side. There were various stuffs wrong with that house but I shall not elaborate here. Now, there is one very important tip that not only this old man told me, but you can read them in books too. Do you know that of all the elements, the water is so damn pahwerfool? It can douse fire, cut through metals (say it dripped for years?) and rock (earth) and drown trees (wood). Heh, you know God drowned the whole creation He made with a huge flood and spare only Noah and his family and animals? So, that’s how powerful water is. 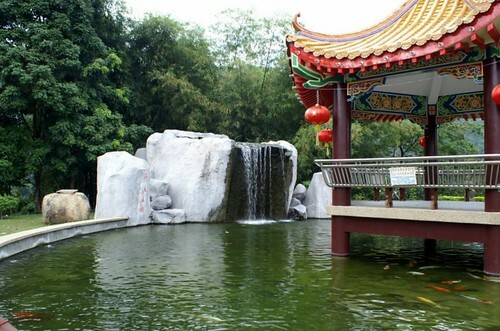 Do you notice that every Chinese temple definitely have some ponds and pools? And big restaurants and businesses have also those tacky koi ponds and smoking windmills? NEVER. EVER. PLACE. IT. ON. YOUR. RIGHT. Unless you are doing a business. Stand inside your house, look out. Your right is that right side. Why? Because? I don’t know but the old man pulled me close to him and whispered to me that if I don’t want a husband straying, I better listen to him. So, women folks, don’t play-play. Otherwise, if you are lucky, you will end up like some women who has three husbands or if not, you will be the number three in line. But men, if you are reading this, you may want to try out to see how effective it is. You will prosper and start collecting concubines. How’s that? Don’t forget to thank me, then. Lilian, too!